Graduate talent is helping an electrical goods wholesaler access new markets and reach more customers. 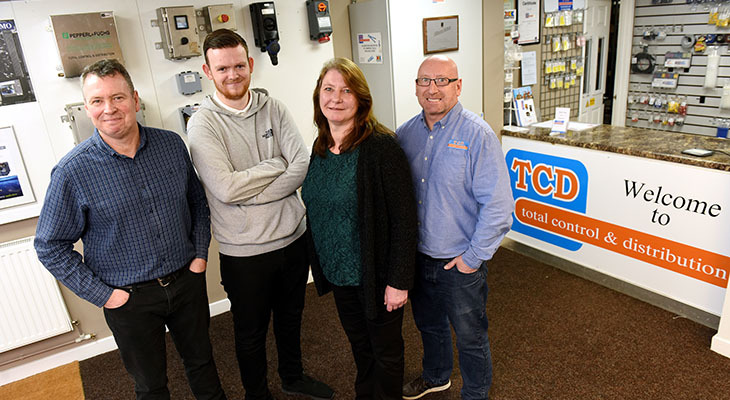 Stockton-based Total Control and Distribution worked with Teesside University and Innovate Tees Valley to develop an innovative web portal to help the company capture new clients. Total Control and Distribution supplies a wide variety of industrial control, electrical distribution and hazardous area product equipment and is official distributor for a number of industrial manufacturers. The company’s management realised that its website was no longer fit for purpose and required updating utilising up to date technology and branding, to ensure its products reached a wider range of potential customers. To assist with this project, it turned to Innovate Tees Valley, a project led by Teesside University, which help companies try new things in their business and create and improve services, products and processes. Through its Knowledge Exchange Internship (KEI) scheme, Innovate Tees Valley was able to part-fund the cost of employing a graduate who worked alongside academics at Teesside University to oversee the redevelopment, making the website more user friendly and increasing traffic through better search engine optimisation. The innovative new design provides a revolutionary transformation of the website developed specifically to capture new clients while providing an easy to use web portal that clients, old and new, can use simply, as it replicates many functions and designs already in use by suppliers and competitors. I’m very confident that this work will start yielding real results for the business. Ian Wilkinson, a director at Total Control and Distribution, said: 'We’d had our website for about six years but it wasn’t working as it should. 'We decided we needed to get someone in to build a new site and look after it full-time. 'We’ve also made real progress with the search engine optimisation. Innovate Tees Valley is formed from a partnership of Teesside University, DigitalCity, Nepic and MPI with funding from the European Regional Development Fund. Through the KEI scheme, Teesside University BSc (Hons) Web and Multimedia graduate Luke Robinson was recruited to carry out the project under the supervision of Alexandra Groves, a principal lecturer in the School of Computing, Media & the Arts. Alexandra said: 'It’s been a very interesting job and being able to work on a real-world situation like this will also be very helpful in my teaching. The latest graduate talent is helping an electrical goods wholesaler access new markets and reach more customers.